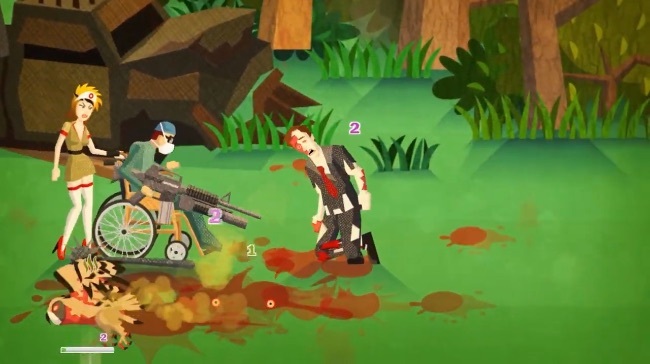 Playable in Single-player or online co-op with up to four players, Infected Shelter puts you in the role of a member of a group of survivors in a post-apocalyptic world that’s filled with infected creatures and rival gangs. After waking up one morning to find that the rest of your group have been kidnapped, you emerge from your shelter and set forth in search of them and a reason they were taken. In Infected Shelter you’ll be able to choose from four different playable characters and use firearms and melee weapons to fight your way across its randomly generated post-apocalyptic world. Along the way you’ll be able to unlock over 50 unique character traits, over 50 brutal execution moves and over 150 blueprints that can be used to make various weapons, clothes, skills, relics and RPG-like character improvements. Death will send you back to the start, but you do unlock some permanent upgrades during play that can aid you on future runs. It’s a fun looking game with fast paced old school side-scrolling brawler combat, lots of cool upgrades, plenty of replayability and some wonderfully OTT cartoon violence. Sign up for the Beta now to you fare in the blood-splattered streets of Infected Shelter.